I’ve spent the weekend in the company of old friends.Friends that I can rely on to be entertaining and amusing. Friends that can elicit either a wry smile or a belly laugh. Friends that move me with tender insights and seduce me with romance. Friends that I can just pick up from where we last left off; that give, but demand nothing. These friends, are three of my favourite stories. When Friday night rolled around, I was so tired after a week of furious writing I didn’t want to think, I wanted to shut my brain down and let something wash over me. 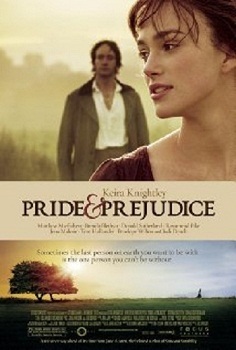 I opened the DVD cabinet and reached for Pride and Prejudice, the movie. I can’t tell you how many times I’ve read the book or watched the BBC TV series (also in the cabinet but I wasn’t up for 6 hours of committed Empire Line viewing). 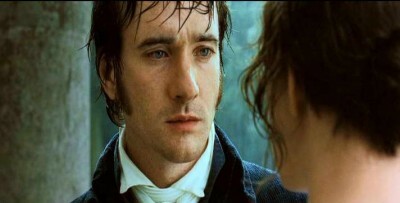 I never tire of Lizzie and Mr Darcy. I have to keep reading or watching, just to make sure they actually do get together. I wasn’t so keen on the movie initially. There’s no Colin Firth brooding arrogantly at the ball, pretending not to notice the ample bosom of Jennifer Ehle, the quintessential Elizabeth. And that iconic scene of him leaving the lake, his white shirt clinging… sigh. 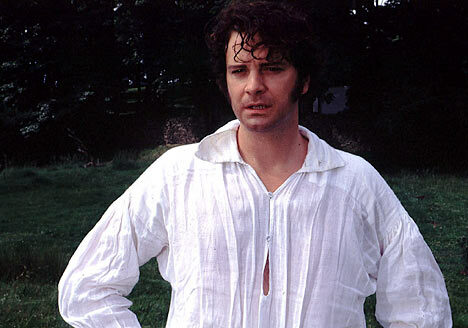 It’s true, Matthew McFayden doesn’t have Coin Firth’s presence, but his Darcy is attracted to Elizabeth immediately. His hand lingers a little too long, the awkward pauses, the snatched glances, you feel his conflicted emotions. And when he first asks Lizzie to marry him, so utterly ineptly on the Rotunda, the rain pouring, his desire zings off the screen. The near kiss, that follows is exquisite torture. I know it’s not meant to happen, but I so want them to kiss right then. Please kiss her, right now. There is a scene, just after Jane’s engagement to the suitably Spaniel-like Bingley, when we pan from window to window of the Bennett house, and like the voyeurs we are, catch fragments of conversations. The tenderness and affection between Mr and Mrs Bennett is completely believable and one of my favourite moments in a film full of beautiful moments. One of the joys of re-reading or re-watching is the delicious anticipation of a favourite moment, scene or line of dialogue. No need to second guess, you know what’s coming. Saturday night’s film isn’t full of quite so many beautiful moments, but About A Boy, adapted form the novel of the same name by Nick Hornby, is a fabulous story. It could be because I rather fancy Hugh Grant. Not with quite the same lustful longing I have for Johnny Depp, but I reckon Hugh Grant would be more entertaining at a dinner party. But back to the story. I love the film and the book. And have revisited both more than a couple of times. They are quite different and there’s some aspects of the story that work better in the film than in the book. And Hugh Grant singing ‘Killing Me Softly’, with his eyes closed, in a school assembly is cringingly embarrassing, hilarious and oddly poignant, all at once. Which really sums up the story. The only drawback is a tendency to spend several days afterwards singing ‘Killing Me Softly’, in the style of Hugh Grant. In between these night-time rendezvous, I have been re-reading Harry Potter and The Prisoner of Azkaban. A burst of nostalgia for the Harry Potter books swept over me after seeing the first part of the final movie. And so to avoid the inevitable conclusion, I started back at the beginning. And it’s just as enjoyable as the first time. All three stories share the strengths of a wonderful narrative arc, strong engaging characters who you want to win. They are all intelligently crafted stories. I don’t think it matters whether you think the book or film is better, sometimes you don’t have the time or functional brain space for a whole book, but two hours spent with an old friend is restorative and good fun. Anything with a musketeer in it! And you? 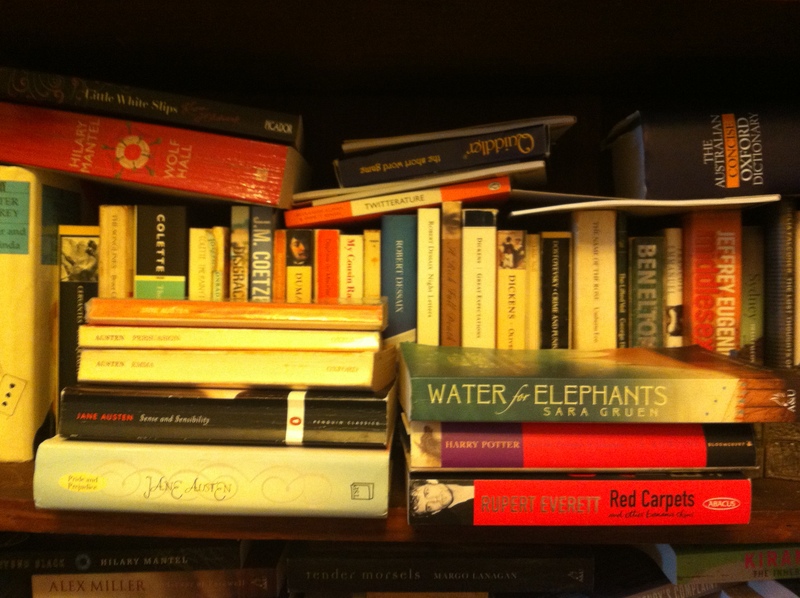 What do you turn to for comfort viewing and reading? It was Wallis Simpson who said you can never be too thin, too rich or have too many scarves. I’m sure she always intended to add the bit about the scarves, if not she should have because it is a truth universally acknowledged, that you can never have too many scarves. I am completely addicted to the scarf. It’s not a new addiction, a passing fad. Nor am I entirely sure how or when it moved from being a recreational pursuit to an almost daily habit. It has been with me for many years and I’m guessing that it has a strong genetic link. It can’t be a co-incidence that I’m wearing scarves my Grandmother collected in London and Paris in the 50’s and 60’s. 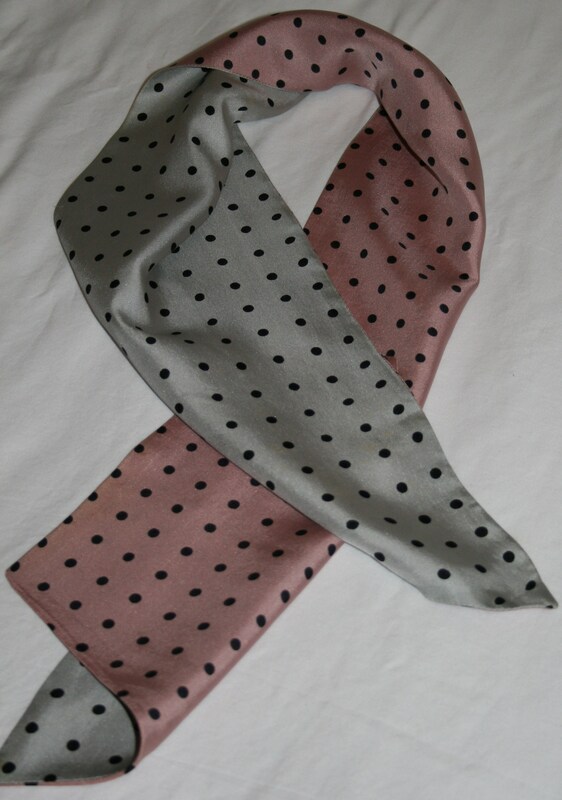 Her scarves are all silk, square, except for a grey and pale pink polka dot sash that ties at the throat, like one of the Pink Ladies in Grease. My three daughters all have the scarf-wearing chromosome and happily enable my addiction with regular gifts. 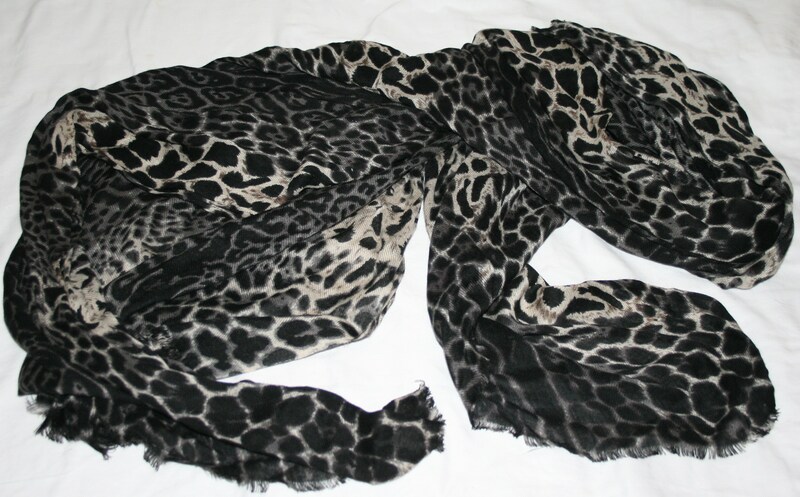 Mothers’ Day just gone saw me presented with a fabulous Leopard Print Witchery scarf, which I have practically lived in ever since. 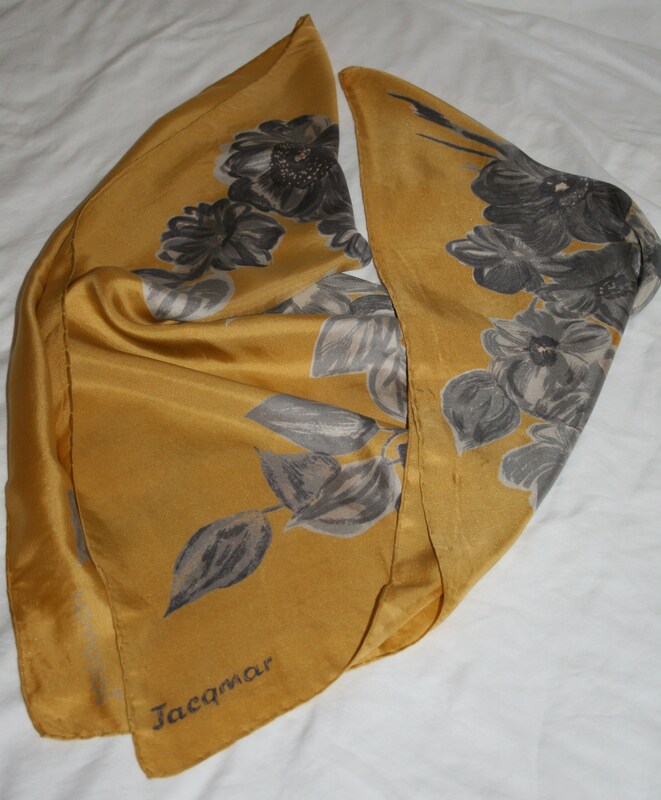 It has replaced last year’s favourite – a Jac + Jack cream and soft caramel fine wool striped shawl. I have scarves I have knitted from hand-dyed silk yarn bought at Paddington Markets, soft Alpaca from New Zealand – and now I’ve revealed my other addiction – knitting. But lets deal with one addiction at a time. 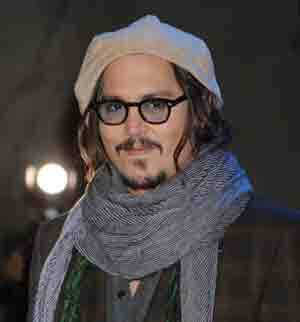 (I have several, by the way, beautiful stationery, fabric, champagne, Johnny Depp). 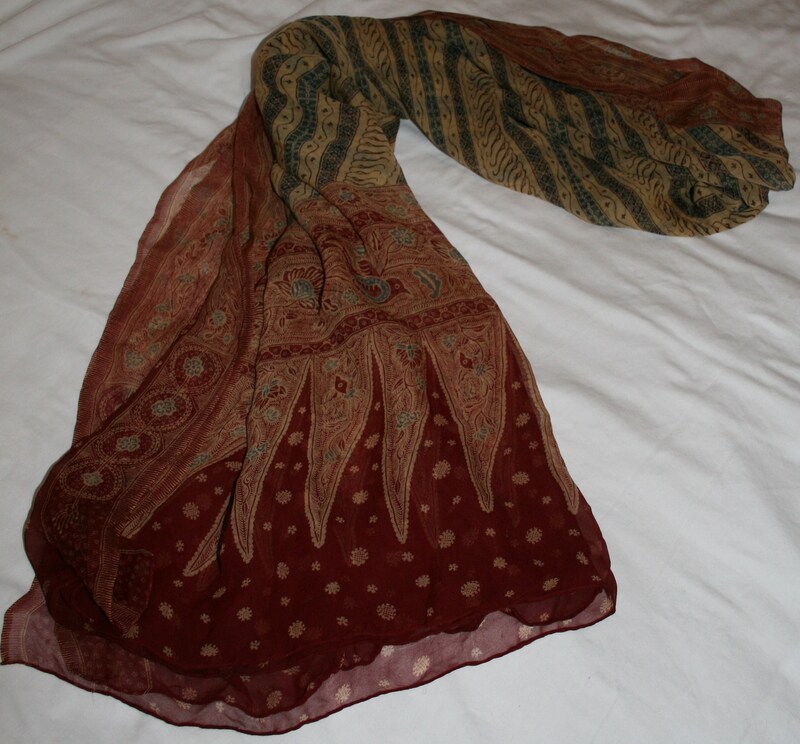 Scarves found me in New York, Florence and London and one particularly delicate, hand-batiked silk one found its way into my suitcase in Ubud. But I still remember my first scarf. A Mulberry swirl of purple, red and cream tasselled cotton bought at Liberty of London, twenty-five years ago. I wore it ’til it fell apart and it lived out its final days in my children’s dress-up box. There was a time when scarves were only worn tied neatly at the neck, the way my Grandmother wore hers, occasionally secured by a brooch. Sometimes they were protectively wrapping ‘The Do’ for a day’s hunting like The Queen. Or as stripey, scratchy, tribal sporting equipment. Now scarves are shawl-like, looped at the throat and left to fall softly covering flabby tums and muffin tops (from the excessive champagne drinking addiction). They transform the simple choice of jeans and a top into an Outfit. Change the scarf and it’s a new outfit. And if like me, you’ve had a Style guru tell you that black is just not your colour, instead of ditching your entire wardrobe, scarves are the solution. And scarves are a year round option, not just a winter-warmer to wear while you slurp pumpkin soup in front of the dying embers of your radiator. I have two favourite summer staples. A watercolour, muted Pucci skinny silk sash and a black and white, scalloped edged silk rectangle from Dolce & Gabbana. As addictions go, I’m pretty committed to it and fantasize about the day when I can combine it with at least two of my others – champagne and Johnny Depp.